Global's Industrial Pedestal Fan Provides Optimum Cool Air Circulation for Warehouses, Factories, Offices, Industrial Kitchens, and more. 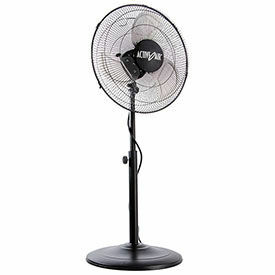 This Oscillating Pedestal Fan has a 3-speed industrial motor powering three precision balanced metal fan blades. The 90° oscillating sweep and the pivot-action fan head allows vertical airflow adjustments for optimum cooling and air circulation in large areas like warehouses. Fixed head positioning feature allows air to be directed to one area. The large pedestal base adds stability and safety. Fans have wire safety guards. 18'L power cord makes it easy to position fan for maximum effectiveness. Tool free hand screw knob for height adjustments. 120V. Meets OSHA standards, UL listed. 1 Year Limited Warranty. 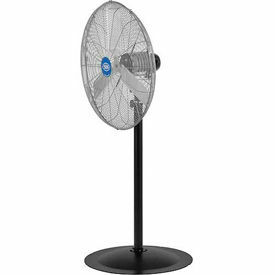 Global's Deluxe Industrial Pedestal Fans are 30 " diameter Fans and feature a heavy-duty pedestal base and hand screw knob for easy, tool free height adjustments. This floor fan has a top of fan height adjustment from 60-81"H. Rugged 3-speed, 10000/8750/7300 CFM, 1/2 HP ball bearing motor uses PSC technology. Oscillating fan motion distributes airflow in a 90° sweep and allows fixed fan positioning. The pivot-action fan head of these portable fans allow vertical airflow adjustments. Guards safely enclose 3 aluminum blades that are precision balanced for optimum performance. 18'L SJT hard service type cord with 3-prong plug makes it easy to position fan for optimal effectiveness. 120V. Meets OSHA standards, UL listed. Global Industrial's Outdoor Rated Oscillating Pedestal Fans have a 2-speed Totally Enclosed Non-Ventilated (TENV) 3/10 HP motor, moisture rated IP24, powering three precision balanced Aluminum fan blades. 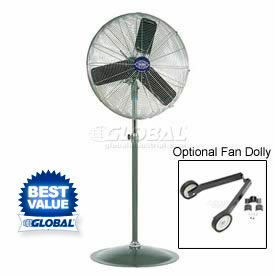 Pedestal fan is height adjustable and comes with a 9.8' SJTW Type Plug. The large pedestal base adds stability and safety. Black Powder Coat Finish. ETL and cETL Listed. 1 Year Limited Warranty.Optional misting kits are available to convert into misting fans. TPI And CD Industrial Pedestal Fans Provide Air Circulation And Cooling For Warehouses, Workshops, Dining Halls And More. TPI and CD Industrial Pedestal Fans provide versatility to suit any cooling needs. Fans feature an open air over ball bearing single phase motor for lasting durability and reliable performance. 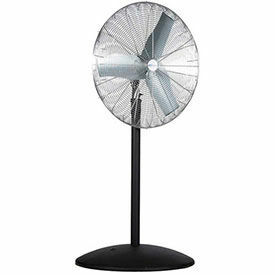 Pedestal fans are made with 3 quiet aluminum blades enclosed in chrome wire guards. Stable base supports tool-free height adjustments. Pivot-action fan head allows vertical tilt adjustments, making it simple to direct air. Features 2-speed pull chain operation. Includes 12' SJT-type 3-conductor power cord. Available in Oscillating and Non-Oscillating models in a variety of power levels. 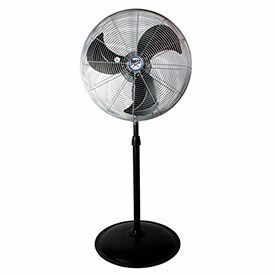 MaxxAir™ Heavy Duty Pedestal Fans Are Used For Commercial, Industrial And Agricultural Applications. MaxxAir™ Heavy Duty Pedestal Fans are solidly manufactured of all-metal construction with rust-resistant powder coat finish for long lasting durability and dependability. Heavy duty 3-speed thermally protected motors. Adjustable fan height. Fan head tilts 90°. OSHA compliant grille. Available in 22 inch diameter model with 6 foot power cord or heavier duty 30 inch diameter model with 9 foot power cord. Easy to assemble with household tools. UL and CUL Listed. Two Year Limited Warranty. 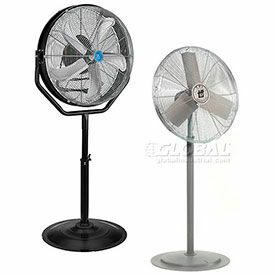 Heavy Duty Pedestal fans are made of high quality materials for long lasting durability and dependability. Fans allow easy mobility for location versatility and storage. Optional oscillating feature increases range for large areas. Fan types are Non-Oscillating and Oscillating. Color finishes are Black, Silver and White. Fan diameters range from 16" to 40-3/8". CFM high ranges from 1100 to 12120. OSHA certified and ETL approved. Dimensions vary per model. Airmaster Pedestal Fans Are Used For Use In Warehouses, Workshops, Gyms And More. Active Air Pedestal Fans Provide Superior Air Circulation for Workstations, Workshops, Offices, and more. 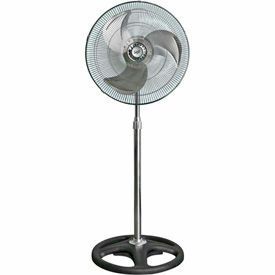 Active Air Pedestal Fans offer continuous and optimal breeze comfort. Durable motor permits uninterrupted operation. Adjustable height in pedestal allows for efficient altitude adjustment. Durable fan and pedestal structure permit for sufficient usage in harsh grow room environments. Maximum high speed capacity is 1350 RPM. Dimensions vary per model. Continental Dynamics (CD) Pedestal fans feature a heavy-duty pedestal base and hand screw knob for easy, tool free height adjustments. Most Pedestal fan features highly efficient 2-speed Totally Enclosed (TEAO)Motors designed to better resist dust and debris for a dependable and longer lasting life. This feature makes the CD Premium line an ideal choice for a wide variety of commercial and industrial applications. 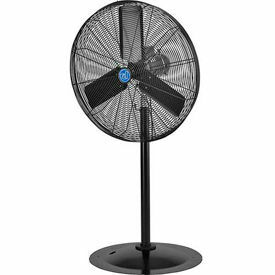 CD Premium Pedestal fans include quiet metal fan blades that are balanced for optimum air distribution and enclosed in sturdy wire guards for safety. Units include pull chain control and 18'L, 3-conductor power cord. 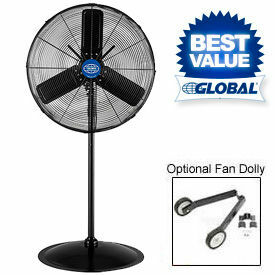 CD Premium Pedestal Fans come in both Oscillating and Non-Oscillating styles. Pivot-action fan head allows tilt angle adjustments. UL and cUL listed 120V.